It is a well known fact [ a favorite Herter-ism ] that 'How to Buy an Outdoor Knife' is one of the most searched for tips amongst outdoorsman, bloggers, gear junkies and kit tarts. With nearly every outdoor commentator or writer chipping in their opinion - usually with a view to selling you one, and that legend of outdoor self promotion, and mail order sales, George Herter was no exception. He dished out all kinds of advice over the years, usually in the 'self published' vein. All delivered in a writing style best described as 'Barking'. Classic stuff. An outdoor knife must be made for service--not show. Your life may depend on it. Real outdoor people realize that so-called sportsmen or outdoor knives have long been made for sale, not for use. The movies and television show their characters wearing fancy sheath knives. Knife makers advertised them and drugstore outdoorsmen bought them. 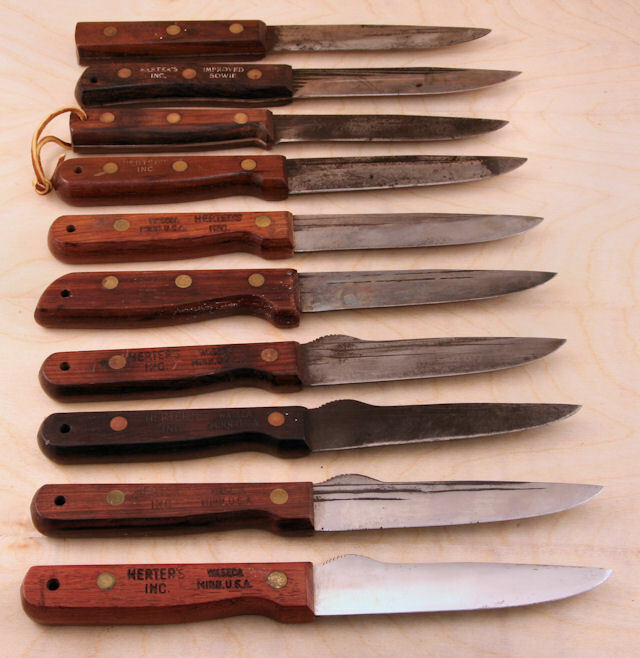 Nothing marks a man to be a tenderfoot more than these showy useless knives. 1. The knife must stay sharp for long periods of time without sharpening. The steel should combine the best characteristics of electric furnace quality high carbon 1095 steel and high carbon 440 B stainless steel. The blade hardness, known among steel experts as 56 Rockwell C, should not be affected by atmospheric moisture, salt spray, fruit acids or blood. It should withstand extreme temperatures without becoming brittle, no matter how cold it may be. A good steel knife blade will "blue" or darken itself with use, making it pratically rustproof. If knife blade steel is really good, it will cut through nails without bending over the edge. 2. The knife must be shaped so it is ideal for cleaning and skinning game of all kinds, from rabbits to moose. The best shape for this is the improved Bowie. 3. The knife must have a handle long enough so that it fits a man's hand so pressure can be put on the blade when desired. On nearly all outdoor knives the handles are much too short. The handle of the knife must be made to last a lifetime. Leather handles rot and mildew, stag handles crack, plastic handles crack and are highly flammable. African mineral-type woods are best, and they will stand all kinds of weather for a lifetime and more. 4. The blade of the knife must not be hollow ground. Hollow grinding weakens a blade so that the edge will bend or break under heavy usage. A wedge edge is the strongest and most durable ever designed. SBW No George that would be the convex edge. More metal behind the cutting edge init. 5. The blade of the knife must be hand forged in order to give the steel maximum strength and hardness. 6. The blade of the knife must not have a blood groove. A blood groove is strictly advertising and badly weakens the blade. Professional butchers do not use them. SBW I make you right. 7. The knife must be easy to carry and light in weight. The blade length must be 4 inches long. Four inches is the length established for a woodsman knife by over 200 years of experience. Blades shorter are all right for Boy Scouts, but not for serious woodsmen, Longer than 4 inches is unnecessary and adds weight. SBW apart from the one you're selling eh George! 8. The knife should have no hilt as it only adds weight. If the knife blade is properly designed, that is slightly indented, you cannot cut your finger no matter how hard you thrust. You need only thrust in a hand to hand combat with a man or a wounded animal. "Most people don't realize that being eaten by a hyena doesn't hurt very much". 9. The knife must be capable of slicing bacon and cutting bread. It must be a comfortable knife for eating and cutting cooked meat. “Milking Scorpions Brings You $150 or More a Week.” Please post a video of your attempts!